Nothing beats riding along the flank of St. Helens. Glaringly white pumice fields are interrupted by large black boulders. Call it the world’s largest zen rock garden. Getting up to the plain is a grind; think granny gear, but it’s well worth it. Save this ride for a cool day, bring plenty of water, and don’t forget your sunscreen and shades. Total distance, out-and-back, is 23 miles. Given the beauty of the trail, you’re not likely to feel all the miles. This is, hands down, my favorite ride. Mark, thank you so much. Contact me any time for the brownies! Did Ape/Plains/Smith loop August 15th. 33 miles of incredible views and trails. Smith is clear. The trail around muddy river has been fixed but isn’t really ridable. Start at the Muddy River camp ground and ride up FR 8322 to the Ape Canyon trail head. If you don’t you’ll be sorry. We made this mistake and ended up have to climb seven miles and 1200 vertical feet back our car after 22 miles on Ape and Smith. Not a fun way to end an incredible ride. There is no water at Muddy river camp ground so bring plenty with you. 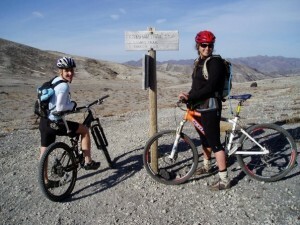 Plain of Abraham/Ape Canyon confirmed open as of 7/2 by Mitchell at Dirty Fingers Bike Repair. Rumor has it that this ride is rideable as of 7/1. This is only a rumor, however. If you have ridden Ape Canyon/Plains of Abraham this year, please confirm the rumor!